Webcow is an Internet surf & download tool that extracts all links of a website and builds a list of them. Includes filters to remove unwanted files and then downloads all selected files into a folder of your choice. Many download managers look the same and do the same - they download files. 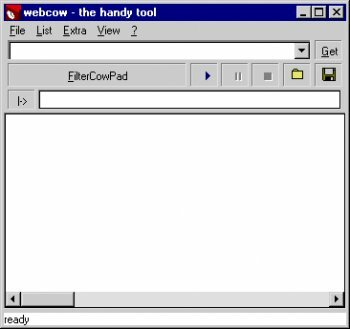 Webcow is a bit more a download tool then a donwload manager. Easy for 'hard to get' downloads and long download lists. It does three main actions: Parsing Pages / a Part of a page (LNL: just select the interesting part in IE), filtering (a comfortable, very valuable filter-system i haven't seen in any download tool else) and downloading with a special engine handling cookies, redirects, cgis and look-like-a-browser. A downside of these specials are that they are unique, so you have to checkout the documentation for using it - but after some time you won't miss webcow any longer for your download operations. Just a handy tool and surf helper. And if you dislike webcow's blocking calls (sometimes it hangs if the server hangs), you can simply re-route all downloads to a big palette of downloaders just with a single click. If they can handle a list of 10k links... .